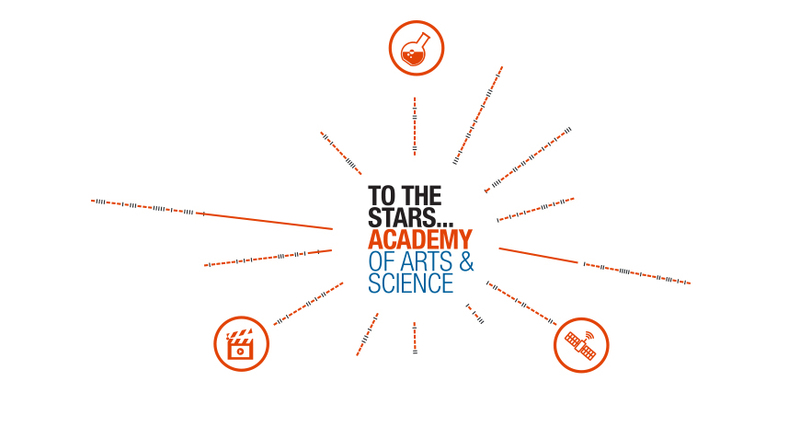 Three areas of interest to be engaged by To the Stars Academy of Arts and Science. On October 11, 2017 the public was informed in a semi-official manner that the US government has been investigating UFOs for at least the past decade, that UFOs are real, and that they are not ours, meaning they do not stem from human ken, logic, or manufacture, and they do not belong to the US military. It follows that human beings are not the highest example of intelligence in our immediate neighborhood. There are others. They are apparently interacting with friends, neighbors, relatives, and fellow citizens. This has been happening for a long time. It is now October 16, 2017 and the mainstream media has not yet engaged with these revelations in a meaningful way. Make a note of that and think about what that possibly means. Her is the list of “starters” on the TTSAAS team roster. These men will be advisers to Tom DeLonge. For me, and I am certain for many others, this event was not only pleasantly surprising, but was also vindicating as well. A group of 6 men held a press conference that was streamed live over the internet, and its purpose was to unveil a plan that could literally change our world. A new corporate entity has been established, one designated “For Public Benefit” called To the Stars Academy of Arts and Science. If you check out their website, https://dpo.tothestarsacademy.com/ (use Google Chrome as your browser) you can research their mission statement, the composition of their team, and how they plan to grow an organization owned by citizen stockholders who are willing to take a leap of faith and invest a minimum of $200 USD for stock that has been valued at $5/share. Yesterday I took that leap of faith and I purchased 200 shares of common stock in To the Stars Academy of Arts and Science. I hope you will consider doing the same, because this effort needs your support. For better or for worse, we live in a nation that is this (flawed) world’s bastion of capitalism, and it is this capitalistic model that has apparently been sanctioned and ordained as the path through which, we are told, vetted and reliable information concerning the UFO phenomenon will be allowed to flow into the public domain. I have chosen to believe in this and give this effort my full support – for now. Mr. Elizondo said he “ran” this program, so he should know what he is talking about! For decades we have known that those words, SPOKEN BY THE RIGHT PERSON, could change public perception about the reality of UFOs. Mr. Elizondo is, finally, the right person who has irrevocably and unequivocally spoken those words. Whether UFOs do, in fact, represent a threat to our world is highly questionable. UFOs and their occupants/creators have been interacting with humanity for a very long time, apparently at least for many centuries, and I am not aware of any events that I could characterize as representing a verifiable threat from UFOs (their occupants) to human civilization on this planet. If I am wrong about this, then the DoD needs to enlighten me and all other citizens about just how UFOs could be considered a threat to our national security. If the US DoD interprets UFOs shutting down its nuclear missiles as a threat to our national security (and such events have happened on several occasions – watch this video produced by UFO researcher Robert Hastings: https://www.youtube.com/watch?v=hUr_TF9o7sY&t=353s), then I would debate that point as follows. At this very moment, a potential conflict that could well involve a global nuclear war has, for some time, been brewing between the nuclear weapons-armed countries USA and North Korea. There can be no debate that this potential conflict does indeed represent a real and verifiable threat to our national security. Previous UFO incursions that have involved shutting down both US and Russian nuclear missiles MUST be brought to the full attention of the public to stimulate wider discussion and public debate concerning what we should define as threats to our national security. We should be enlightened as to what specific past UFO events have been interpreted as threats to our national security. UFO incursions involving shutting down nuclear missiles could, and I believe do, represent an effort directed only toward awakening mankind to the very real and present danger nuclear weapons represent to the survival of not only our human family, but also to the millions of evolved species on this planet who have no voice at the negotiating table. We need much more discussion about what true stewardship of this planet should look like. Hopefully, To the Stars Academy of Arts and Science will serve as the catalyst that will enliven this much-needed conversation. I am a physician in the relatively small town of Helena, MT. It was here that I first met and then got to know Dr. Jesse A. Marcel Jr., his wife Linda, and several of his children. These relationships began in 1988 and go on through the present. When Dr. Marcel told me that his father, Major Jesse A. Marcel Sr., had been directly involved in the recovery of a crashed UFO near Roswell in 1947, one that “was not of this world”, I knew then, and I know better now, that he was not a liar. There are, apparently, many liars in this world, but I knew that he was not one of them. For many years I have felt that this information was so important for people to know and to take to heart that I have been compelled to talk with people about this at every opportunity, to engage in public presentations about UFOs, to teach courses about UFOs in college classrooms, and to open a library (The Jesse A. Marcel Library – http://www.jaml.org) containing as much information about this subject as I felt I could afford to acquire and make available to the public. I cannot tell you how much easier it will now be to stand in front of both friends and strangers and state, with complete conviction, that the UFO phenomenon is real and it is important, for now my statements will be backed up by the words of Luis Elizondo, quoted above, and several others who spoke at this press conference. 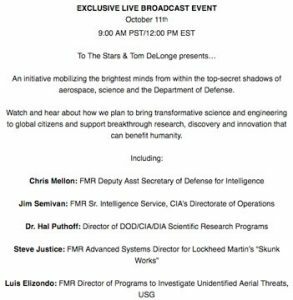 Their previous career positions within the DoD, CIA, and Lockheed-Martin Skunk Works entitle them to speak out with authority on the reality of UFOs. OK Tom, to help push your effort forward I am willing, for the present, to ignore 7 decades of the UFO cover-up and all the implications of that. I see an opportunity here. This is a real breakthrough in the UFO Truth Embargo stalemate, and I am going to make every effort to help this roll out and to progress smoothly. I want this effort to succeed, and my $1000 investment in To the Stars Academy of Arts and Science has nothing to do with it. This is about UFO Truth and, at this point in my life, there is little if anything more important to me. My investment was, plainly and simply, a vote of confidence in Tom DeLonge and a leap of faith that he and his team are going to take the UFO reality in a new and fruitful direction. That is my hope. Toms statement clearly alluded to the Roswell incident, and I am grateful that at least there was some minimal attention given to this truly milestone event. It is Roswell, more than any other UFO event in history, that has sustained the drumbeat of UFO Truth for more than 7 decades. Yesterday, we finally heard the truth spoken from living people in career transitions whose immediate previous job descriptions involved not only hiding the UFO phenomenon from the American public, but also in trying to understand it, and to reverse engineer the hardware that was recovered from Roswell and other such events. I am certain that Dr. Marcel, my friend and my colleague, would have loved to listen to this press conference while he was still alive but, as they say, this event has come too little, too late. Nonetheless, I hope we will soon see whether 7 decades of concerted efforts within the DoD to capitalize on Roswell has now brought us to a time when all of humanity will benefit from this momentous event – because the fruits of Roswell should belong to all of us. To the Stars Academy of Arts and Science is apparently the vehicle through which such benefits may finally redound to tax-paying American citizens and, indeed, to all the citizens of Earth. Mr. Semivan, I couldnt agree more, and your statement signals a sea-change in the attitude of the DoD and the US government with regard to UFOs. This press conference, and the now irretrievable words that were unequivocally spoken, leads us to several conclusions: the UFO phenomenon is real, they do not originate within the US, Russia, China, or any other nation on Earth, and they are complex technologies of incredible aeronautical capabilities that have deeply concerned some of the most clandestine military, scientific research, and intelligence efforts of the major nation-states of our world for decades. They stem from an interested and an interesting intelligence we do not yet know, but one that is most certainly here, now provably here, monitoring Earth and interacting with human civilization. They appear to be at least neutral, if not benevolent. We would all do well to pay attention to these important developments. You can begin by watching and listening to the press conference referenced above in this video (below). Think carefully about all the implications of what you are about to learn. Tell me–when you consider that what is at stake here is probably the most disruptive technologies to ever be released on this planet and when the release of these technologies will, if effected, completely disrupt and overturn the entire energy sector including big oil, and the entire transportation sector including all of it’s massive infrastructure and that this will involve disruptions in trillions of dollars of commerce in ways that we can’t possibly, now imagine, do you really think that Delonge’s campaign to raise a few million dollars (chicken feed) is anything but a distraction or a ruse? This is orchestrated by people and powers that we know nothing or little of and the idea that our $200.00 or so is needed by them is incredibly naive!! Think about this a little while! I do not share your pessimism about a future without Big Oil. Yes, Big Oil is going to be left behind in all of this, and I say “good riddance”. We are already late for this to happen. Oil, with all of its uses, has been and will continue to be an indispensable commodity for the human race, but not oil for energy. We now know there are better, cheaper, cleaner ways to produce the energy our civilization requires in ever increasing amounts, prodigious amounts, and it is time to move on. The motto of CCRF is “adopt, adapt, evolve”. Big Oil’s vast infrastructure is going to be replaced and this is going to provide opportunities for new technologies, new jobs, and new modes of transportation that will make our current modes of transportation look like our past age of the horse and buggy looks to us now. I look upon Tom Delonge’s “for public benefit” corporation, To the Stars Academy of Arts and Science, as a means of enticing everyday people from all over the world (anyone willing to risk $200) to seriously engage with the UFO topic while also offering us an opportunity to financially benefit from being involved in this. It’s a “carrot on a stick” that will help persuade people, at least those who choose to invest, to try to help all of this move in a positive, fruitful direction. In Tom’s unveiling of TTSAAS we were told by those who would know, in no uncertain terms, that the UFO phenomenon “is real”. This was a momentous event. Never before has anyone so officially connected with the study of the UFO Phenomenon within the Pentagon uttered those words so directly. Do you think they would make this announcement in this way, involving these people, without having a carefully thought-out plan to achieve the stated goals that has been given a “green light” by those in control of the UFO information? You are right in saying they probably do not need our $200 to achieve these goals. The fact is, we are all being extended the opportunity to invest and to financially benefit from this effort. Perhaps this is a high-risk investment, but I, for one, am jumping on-board this train. I have listened to several interviews with Tom DeLonge over the past 2 years, and there is no question in my mind that he is sincere and straight up about everything he is trying to do relative to UFOs. I intend to help him accomplish what he is trying to do, and I hope to benefit from this financially as well. Maybe I will and maybe I won’t, but I see this as no different from any other investment I have taken on as a financial risk in the past, and there have been many. I do not consider myself to be an expert investor but I will say that most, but not all, of my previous investments have turned out well for me. Truth Will Out” and this seems to be now proven, but it has taken an agonizingly long time to happen. I’m personally thankful that I have lived to see it. You may agree that the following URL though seemingly originating some years ago and the provenance seems a little mysterious, could be an invitation to a another breakthrough of even greater moment. Incidentally, there have been eight crop circles in the UK this year, some with remarkable examples of hidden structural Polygons. See my recent article In the Research Pages of “The Crop Circle Connector 2017” My best regards and many thanks for your own persevering research in these phenomena. I, too, am glad to be alive at a time when the truth about UFOs has finally been spoken out loud by someone (Luis Elizondo) who was intimately involved in managing the UFO topic within our government. This is a momentous announcement and I am surprised that the MSM is continuing to avoid any follow-up of this announcement over the past week. This non-action provides additional evidence that our major news outlets, blasted in our faces through our TVs 24/7, are clearly told what they will present as news, and how they will present it, to develop and sustain approved official narratives about whatever. Thank you for this link. I voted “YES” on this referendum about a decade ago. It is good to bring this to the attention of others who may not be aware of it. I cannot vouch for who or where this idea came from, but I have taken it somewhat seriously. I encourage others who have not seen this before to read the referendum and vote YES! Thank you Jack for your own persistent work in trying to understand Crop Circles. I will take a look at your article in CCC.